Pro tip for anyone who’s been bummed about the absence of Jon Stewart during this election cycle: Make sure to watch Monday’s edition of The Late Show With Stephen Colbert. The former host of The Daily Show will appear on Colbert’s CBS 11:35 p.m. program to help kick off two weeks of live editions timed to the Republican and Democratic National Conventions, Vulture has learned exclusively. Exactly what he’ll be doing Monday remains a mystery, at least to prying reporters. (A CBS rep declined to comment.) 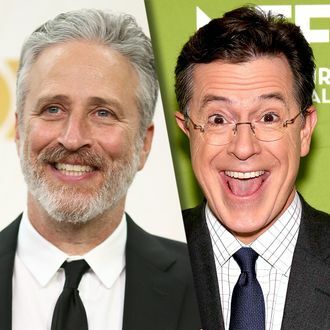 Colbert is anchoring the Late Show from New York, so it doesn’t seem a stretch to imagine — or maybe the word is “pray” — Stewart will be on location in Cleveland as a correspondent at the RNC. (If so, he’ll almost certainly be spotted by one of the thousands of journalists in town to cover the expected coronation of Donald Trump.) It’s also possible that Stewart’s visit Monday could be nothing more than a quick cameo, as he’s done it before for both the Late Show (on which he serves as an executive producer) and fellow Daily Show colleague Samantha Bee’s Full Frontal. Either way, Jon Stewart + Stephen Colbert + Republican National Convention = is it Monday yet?